Nate Jestes battles his bull during Tuesday’s Bullfighter Only event in conjunction with the Dodge City Roundup Rodeo. Jestes scored 91 points to win the event. DODGE CITY, Kan. – Nate Jestes has another reason to love Dodge City Roundup Rodeo. On Tuesday night, Jestes posted a 91-point score to win the Bullfighters Only stop in Dodge City and pushed himself back to the No. 1 spot in the BFO standings. Jestes was the standings leader much of the season but was passed by Rutkowski a little more than a week ago. With his marking Tuesday, Jestes has the second highest score posted in Bullfighters Only’s inaugural season – Tuckness was 91.5 points to win Cody, Wyo., a month ago. 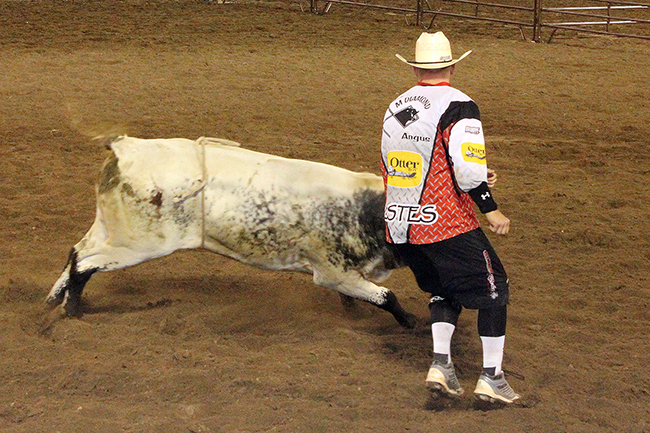 The total score on a 100-point scale is based on up to 50 points for the bullfighter and 50 points for how well the bull performs. The Wyoming man knew he had a great opportunity even before his fight began, thanks in large part to one of the other combatants. Bullfighters Only was developed a little more than a year ago and has been playing in front of some of the biggest venues and most prestigious events in the game. Dodge City Roundup Rodeo is just one of a number of the top rodeos in the country that is featuring the BFO in 2016. “I think we’ve done a very good job of bringing the freestyle bullfighting world back to the mainstream,” Jestes said. It was a big hit in Dodge City on Tuesday night, and Jestes is glad. This is his second year to serve as a protection bullfighter, and he is excited to be the first champion of the Bullfighters Only event in Roundup history.